A council has hit back at criticism over potential exploitation of photo competition entries, saying that use of amateur pictures is becoming ?commonplace? on TV and in other media. Though rules for Blackpool Council?s ‘Love Blackpool’ competition state that copyright remains with the entrant, they also grant the council ?a perpetual, royalty free, non-exclusive, sub-licensable right and licence to use, exhibit, reproduce, modify, adapt, publish, distribute? make available to the public and exercise all copyright and publicity rights?? Among those livid at the rules is local resident Myk Ripley, one of Amateur Photographer‘s (AP) website forum moderators. He led the protest by contacting Blackpool Council to demand an explanation. Myk’s letter, also posted on the website BlackpoolNow, expressed photographers? disapproval. It stated: ?It seems to me that it amounts to little more than a rights grab, a means for Blackpool to acquire imagery for perpetual free use, regardless of its origin or copy ownership and without credit to its originator.? 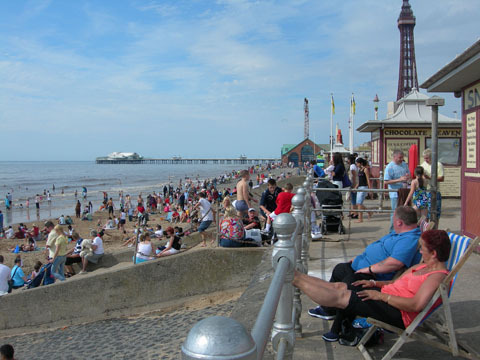 Blackpool Council PR manager Barbara Aird told AP that the competition was aimed at holidaymakers. She admitted that the contest would give the council a ?fresh set of images? for possible future use in tourism brochures. But she defended the use of pictures, justifying future publication by saying that amateurs? pictures are increasingly used on TV news programmes and as the backdrop to weather forecasts. Aird believes this is an indication of how the use of images has changed. She pointed out that the council would not be making any money from the photos, as it does not have a ?commercial arm?. In her reply to Myk, Aird wrote: ?Whilst we understand that copyrighting and licensing of images is a serious issue for photographers we would hope many aspiring amateurs would use this competition as a chance to get themselves noticed and earn some free publicity?.? She claimed: ?Crucially, we are hardly stealing the entire creative abilities from any entrant with just one photo. ?